Why I believe that the loss of the sense of the sacred is the primary reason why we have lost millions of Catholics to faithful worship. Editor’s note: The following address delivered to the Baltimore Chapter of Legatus on March 14, 2018. I told an archbishop-friend of mine that I was going to address business people about liturgical concerns. He was slightly bemused and said, “With all the problems in the Church and the world, you’re going to talk about liturgy?” He went on: “Of all the clergy I know, you and Cardinal Sarah are at the top of my list, but I don’t get the stress on liturgy.” I replied: “The principal reason for the existence of the Church is to offer fitting praise and worship to Almighty God. There is nothing more important. If we can’t get that right, we can’t get anything else right, either. Indeed, every other good thing we may want to accomplish flows from our life of worship.” He seemed to “get it,” although I am not sure if it will stick with him long-term. I hope I can have a more lasting effect on you. When people talk about liturgy in the contemporary Church, they tend to begin with the Second Vatican Council, which is about a century too late. Sacrosanctum Concilium, the conciliar Constitution on the Sacred Liturgy did not emerge full-blown from the brow of Zeus; rather, it was the culmination of a century-long liturgical movement, “canonized” by Pope St. Pius X and especially by Pope Pius XII in Mediator Dei. I was the beneficiary of that process, having had an intensely strong liturgical formation as a boy: I never attended a Mass without full congregational participation; we had a full-time director of liturgical music for our school, so that by fourth grade, we had learned seven Gregorian chant Masses. I realize that was not a universal phenomenon, but it was surely the clearly stated goal of all the popes leading up to Vatican II. Truth be told, by 1968 – that annus horribilis – the Sacred Liturgy was in a shambles, and the worst changes had not even yet been made. The chief architect of these machinations was Archbishop Annibale Bugnini, who had gotten the ear of Pope Paul VI, convincing him that this was all necessary if the Church were to be a vital force in the lives of the faithful. Of course, “the faithful” were never consulted about any of this. When the bulk of the damage had been done, Pope Paul finally came to see the evil wrought by Bugnini and followed an ancient principle of ecclesiastical maneuvering, promoveatur ut removeatur (let him be promoted, so that he can be removed). In 1976, the Pope named Bugnini pro-nuncio, exiling him to Iran and thus placing him there at the time of the hostage crisis at the United States embassy. The sum-total of both authorized and rogue changes was a manifest loss of the sense of the sacred, causing hundreds of thousands of Catholics to decide to vote with their feet, resulting in the abysmal figures of Mass attendance now found almost universally. I met one such individual on a plane a number of years ago. After ascertaining that I was indeed a Catholic priest (and not a Protestant minister), the man informed me that he had quit Sunday Mass very early on in the experimental era. He said that he returned about thirty years later for the first time to attend his mother’s funeral. “I was shocked,” he said. “Finances must have gotten really bad. I supposed that the old altar was broken and they couldn’t afford to repair it because the priest was saying Mass on an ironing board. There was also some woman helping him give out the bread.” How’s that for a Rip Van Winkle experience? Fifty years into this morass, many are calling for an objective assessment, leading to a “reform of the reform.” I count myself among that number. Sometimes, someone will say: “Do you want to turn back the clock? 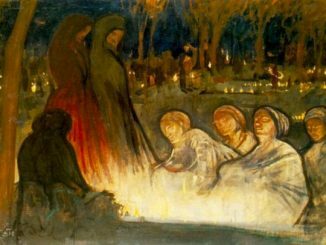 You can never go back.” I have a stock response: If you go for your annual physical and the doctor tells you that you have to lose fifty pounds or you won’t be around for next year’s visit, he is telling you that you have to “go back” to the weight you carried perhaps thirty or forty years ago. Survival often requires retrenchment. One of the most consistent voices for this kind of honest introspection was Joseph Cardinal Ratzinger for decades before he became Pope Benedict XVI. In book after book and lecture after lecture, Ratzinger bemoaned the liturgical chaos and confusion into which we had descended. Sanity and maturity require us to admit that serious mistakes were made and, unfortunately, done in a time of civil and social unrest which only exasperated the problem. Upon acceding to the Chair of Peter, Benedict made some efforts at reform, however, the difficulties are so great and the abuses so ingrained that it’s like trying to turn around a Mack truck on a single-lane road. In the past few years, Ratzinger’s mantle of reform has been assumed by the Guinean Robert Cardinal Sarah. Two works of his are particularly valuable: God or Nothing and The Power of Silence: Against the Dictatorship of Noise. He was appointed by Pope Francis in 2014 to serve as the prefect for the Congregation for Divine Worship and the Discipline of the Sacraments. Although Francis does not have much of a liturgical sense or appreciation, it is interesting that he told Sarah he wanted him to pursue the vision sketched out by Ratzinger. Which he has done – in spades. He has spoken forcefully and convincingly about the need: to return to the celebration of Holy Mass with priest and people facing the same direction – liturgical East; to restore generous amounts of Latin; for Holy Communion to be administered on the tongue to one kneeling. Permit me to comment on a few of these issues. 1. Cardinal Sarah has weighed in heavily on the importance of re-establishing the traditional mode of offering Holy Mass ad orientem, that is, priest and people facing East. Not infrequently, we hear an inaccurate and nasty description of this posture as the priest “turning his back on the people.” In the Early Church, all Eucharistic celebrations were offered facing East because of a two-fold belief: that Christ would come again during the Sacred Liturgy and that He – the Orient from on High – would come from the East. Thus, churches were constructed with the apse (or sanctuary) toward the East; interestingly, St. Peter’s Basilica was built facing west, with the result that the Pope faced the people, however, in the ancient practice at the beginning of the Eucharistic Prayer, the people “turned their backs” on the Pope and faced the door of the Basilica, so as to greet Christ, should He appear! Why is this so important? Because when the priest faces the people, through no fault of his own, the liturgy becomes a conversation between the priest and the congregation and, often enough, a very priest-centered personality cult develops. It may surprise you to learn that the current edition of the Roman Missal (like all before it) presumes that at least from the Liturgy of the Eucharist forward, the priest is not facing the people, hence, the rubric which directs him to “turn and face the people” to give various greetings and blessings. Of course, it makes absolutely no sense for the priest to face the congregation during the Eucharistic Prayer, which is addressed to God the Father! For the first half of the Mass, which is generally directed to the faithful, facing them makes perfect sense. However, when speaking to God, face God, no? 2. The banishment of Latin from the Roman rite is especially woeful for a variety of reasons. In almost every world religion, public worship is carried on in a sacral language. Even Reform Jews (the most liberal branch of Judaism) conduct significant portions of their services in Hebrew. Over and above that, for a universal Church (in an age of high mobility), the ability to worship in a common language is most important. How many of you have gone on a business trip to Tokyo, for example, finding yourself attending Sunday Mass in Japanese (which I presume most of you do not know)? Furthermore, the great patrimony of liturgical music from Gregorian chant (hailed by Vatican II as holding “pride of place” [SC, n. 116]) to Renaissance polyphony is unknown to most Catholics for the past fifty years. Ironically and sadly, there is a better chance of hearing Latin sung in an Anglican or Lutheran church than in a Catholic parish today. 3. In 1973, Pope Paul VI promulgated Immensae Caritatis, which permitted the use of the non-ordained to distribute Holy Communion in extraordinary circumstances. I recall once visiting a parish to find someone identifying herself as the “ordinary” minister of Holy Communion. When I corrected her to say “extraordinary,” she replied, “How can that be? I do it every week!” In another parish, where I was substituting for the parish priest, I celebrated the school Mass every day for a week. A fourth-grade boy had served the whole week, at the end of which I said, “Gus, you are a really fine server. Perhaps you will be a priest some day.” “Oh, no, Father. I thought about it but I don’t want to be a priest any more.” “Why is that,” asked I. “Well, I checked it out: You have to study a really long time, you don’t get much money, and my grandmother already gives out Communion!” How’s that for vocation promotion? More to the point: I have spoken in over eighty dioceses of the United States and more than a dozen abroad. In almost every situation, I found myself with so-called “extraordinary” ministers of Holy Communion. In not a single instance were the norms of Pope Paul verified. Recourse to such ministers undermines at one and the same time the Sacrament of the Eucharist and the Sacrament of Holy Order. St. Thomas Aquinas put it succinctly in Sacris Solemniis (one of his musical compositions for the feast of Corpus Christi): As only a priest can consecrate, so only a priest can distribute. Very logical. 4. 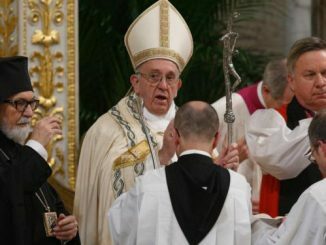 In 1969, Pope Paul promulgated Memoriale Domini, in response to bishops of certain countries – against all liturgical law and tradition – allowing the laity to receive Holy Communion in the hand, rather than on the tongue. 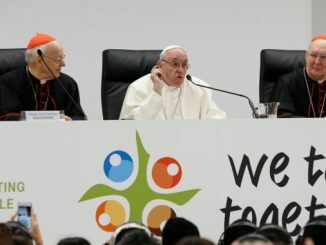 The Pope expressed his dismay at this development and indicated that he had surveyed the bishops of the world on this matter. Two-thirds of the worldwide episcopate disapproved of the practice. Paul then tried to play Solomon by forbidding the practice – except in the few countries where it had been done illicitly (namely, Germany, Belgium, Holland and France). Needless to say, it makes no sense to give approval to actions that were clearly acts of disobedience. At any rate, if the document had been taken at face value, the illegitimate practice would have been legitimized in only four nations. Instead, other episcopal conferences began to petition the Holy See for the indult (which, canonically, is a grudging permission); all who asked for it, received it. On at least three occasions, the bishops of the United States voted against introducing the practice. Only after gross machinations did it finally pass in 1977. Since then, priests (even those supporting the practice) report that consecrated Hosts are regularly found in pews, in missalettes and even in toilets; we also know that Hosts are taken from church and used in Satanic Masses. Proponents of Communion in the hand counter that “this was how Communion was distributed in the Early Church.” Well, yes and no. There are certainly indications that this was done in some places. However, by the time the Christological controversies of the first centuries were settled and when Eucharistic theology was firmly in place, the practice either died out or was suppressed. So, when did it get revived? At the Protestant Reformation. Martin Bucer, one of the most radical of the would-be Reformers, insisted on the necessity of disallowing Communion on the tongue and mandating Communion in the hand because, he said, this would obliterate belief in the Real Presence of Christ in the Eucharist and, simultaneously, would denigrate the ministerial priesthood. I am sure many of you have seen the famous Gallup Poll which revealed that less than a third of Catholics who receive Holy Communion each Sunday hold to the orthodox understanding of the Sacrament, that is, that the Holy Eucharist is the Body, Blood, Soul and Divinity of our Lord Jesus Christ. It is no accident that the traditional Catholic language speaks of “receiving” Holy Communion, while an alternative verb now competes with it, so that some speak of “taking” Holy Communion – which is, yes, the Protestant manner of speaking. Receiving on the hand also has another perhaps unforeseen consequence: it places the recipient in the role of intermediary. When someone is baptized, he doesn’t take the water from the minister and pour it on himself; when someone is receiving the Anointing of the Sick, he doesn’t take the oil and daub it on himself. In this instance, the recipient takes the Body of the Lord from the minister and administers it to himself, which changes him from being a humble recipient to that of an active minister. 5. During Pope Benedict’s pontificate, he determined that those receiving Holy Communion from him should do by receiving on the tongue and kneeling (it may surprise some to learn that Pope Francis has never given Communion in the hand as Pope). Benedict said he was doing this by way of example, hoping that priests would follow his lead. What is the significance of kneeling? It is at one and the same time the posture of humility and adoration. Benedict was fond of quoting St. Augustine who declared: “Let no one receive who has not first adored.” The external sign of kneeling helps to safeguard the sacrality of the action of receiving. Admittedly, the Churches of the East (both Catholic and Orthodox) receive standing, however, so much else in their liturgies emphasizes the transcendent that there is little danger of obscuring that dimension. Here is everything which can lay hold of the eye, ear, and imagination–everything which can charm and bewitch the simple and ignorant. I wonder how Luther ever broke the spell. I saw the raised Host – the silence and simplicity with which Christ once again triumphed, raised up, drawing all things to Himself – drawing me to Himself. . . . I was the only one at the altar rail. Heaven was entirely mine – that Heaven in which sharing makes no division or diminution. But this solitariness was a kind of reminder of the singleness with which this Christ, hidden in the small Host, was giving Himself for me, and to me, and, with Himself, the entire Godhead and Trinity – a great new increase of the power and grasp of their indwelling that had begun [in me] only a few minutes before at the [baptismal] font . . . . In the Temple of God that I had just become, the One Eternal and Pure Sacrifice was offered up to the God dwelling in me: The sacrifice of God to God, and me sacrificed together with God, incorporated in His incarnation. Christ born in me, a new Bethlehem, and sacrificed in me, His new Calvary, and risen in me: Offering me to the Father, in Himself, asking the Father, my Father and His, to receive me into His infinite and special love. . . .
Do first communicants today have such experiences? I am afraid not. So, why have I spoken on these concerns with you, even at the risk of upsetting some of you? Because I believe – along with Pope Benedict and Cardinal Sarah – that we have gotten off course and we have to make a course correction. I am convinced that Vatican II was on-target in asserting that the Sacred Liturgy is truly “the source and summit” of the Christian life. And so, I would like to encourage you to encourage priests to follow the aspirations of Cardinal Sarah and to encourage especially the young priests who have probably already moved in this direction by offering them your support. The fundamental posture of the human person before God is that of humble adoration, exemplified by St. John Paul II even in his weak and dying days. How instructive and inspiring to see him, Sovereign Pontiff and Vicar of Christ, in his crippled state kneel to receive the Body of his Lord on his tongue like the humblest of Catholics. May his memory inspire us to imitate him, to the glory of God and the edification of every member of the Church. I hope this also helps my archbishop-friend see why this is all so critically important. Splendid, deeply moving piece. Thank you, Father Stravinskas and CWR. Liturgy isn’t everything, it’s the only thing. The progressives at the Council knew what they were doing when they moved SC ahead of the rest of the agenda: Get the liturgy in play (regardless of what SC may have said literally), and the rest of doctrine and practice can be modernized. Excellent piece Father. Just a few observations I have witnessed pertaining to the points you made. I attend daily Mass as often as possible, in churches all around my diocese. There are too many times to count where I have been to Masses with fewer than twenty people, where the priests could easily have given out Holy Communion by themselves, yet they had an EMHC hand out communion along side them. I believe they saved 75 seconds of time. I have also been to a Mass where during communion, the ladies behind me were talking about the casino they had been to earlier, in a loud whisper. In the same church one week later, the priest gave a looooong homily, which is okay. But what ticked me off was he said they would skip the one minute Nicene Creed because it was too hot in the church. One church which is very traditional is asking for donations for an altar rail. Too bad they tore up the beautiful one that was there until the early 80’s. Thank you Father for your beautiful, insightful and inspiring article. Outstanding essay, thank you Father and CWR for posting it! It is a real joy to read these lines, like water on a dry land. I save it for further meditation. God be with you all.Amen. I recently attended the Holy Sacrifice of the Massignment at a church in New Jersey. There were 7 extraordinary ministers of Holy Communion. The Church was sparsely filled for this Sunday Mass. I remarked to my wife that it took just a long for the priest to administer Holy Communion to the “Extraordinaries” and then to present them with the Sacred Vessels than it would have if the priest had distributed Holy Communion himself. But, it was 8 minutes of great entertainment to watch. Yes, it’s no mystery why many are leaving the Church. Believe me I did NOT write the word “Massignment.” Spellcheck thinks it smarter than the writer and there seems to be no way to edit one’s comment on this page. In my parish, by order of the parish priest, there must be 2 (not so) “extraordinary” MHCs at every weekday Mass (average congregation 20 to 40) 9 at the main Sunday Mass (average congregation 300)and 7 at the other Sunday Masses (average congregation 200, and Communion must be offered under both kinds to all the congregation at all Masses. 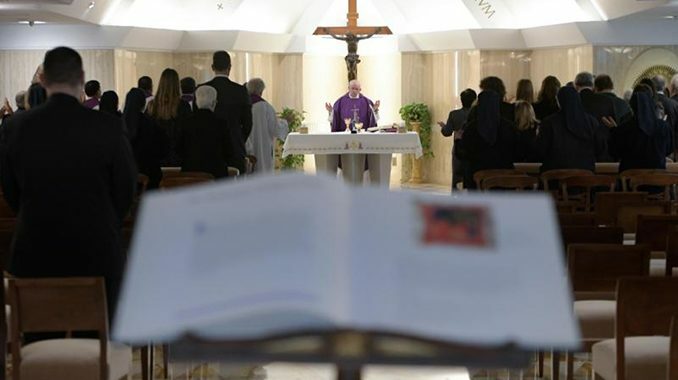 We are often up to the third verse of the Communion hymn before the ritual of communicating to all the EMHCs and handing them their chalices and ciboria is finished and they and the priest can finally start administering Communion to the rest of the congregation. I swear it would actually take less time if the priest distributed Communion to all the faithful. Especially if they were kneeling at a communion rail and if he reminded them beforehand of the requirements that need to be fulfilled for someone to be properly disposed to receive Communion. I grew up before the Second Vatican Council so I have lived through what Fr. Stravinskas describes. As I understand it, the liturgy is the doorway through which we come to intimacy with God as members of Our Lord’s mystical body. The temptation is to remain in the doorway because intimacy is demanding. We must make ourselves vulnerable to Him as He made Himself vulnerable to us, and this takes tremendous trust that He loves us. I asked our Priest if we could install an Altar Rail. (It was removed some years ago.) He said our Bishop would not approve it. The more I read articles like this and Peter Kwasniewski’s books, the more I ask myself why I still attend the NO Mass. The closest TLM is over an hour away. The closes Latin Mass to me is also more than an hour away and i have to get up at 5 in order to get there. I’m 74 and it is worth every minute of lost sleep, of a long drive, of whatever – trust me. Get there early, as in an hour early if possible, and just sit there in an empty Church with just a few lights on – THAT ALONE is worth the drive. Recommended reading ‘ The Power of Silence Vs.The Dictatorship of Noise’, by Cardinal Sarah. Read slowly. Dear Fr. Stravinskas, than you for your refreshing article. I am happy to affirm that, having discovered the Mass of the Personal Ordinariate (of the Chair of Saint Peter), i.e., Divine Worship, I have found a home where God is worshipped “in the beauty of holiness” (Ps. 96:9). Leaving the Ordinary Form of the Mass was provoked by one of those “last straw” moments. However, more than running away from the bad, my journey to the Ordinariate was a sprint toward the True, the Good and the Beautiful: ad orientem worship of God; homilies fully grounded on/in Holy Scripture; chant and polyphony true to the text of the Mass; kneeling to receive Holy Communion on the tongue; priests wholly dedicated to the worthy celebration of the Mass. One could go on and on. I am sick to death of hearing about how Vatican II didn’t intend to do this or that and how it was high-jacked. All we have is a few people talking while the destruction continues un-abated. Even Pope Benedict – all he can do is give an example? He was the pope. If he couldn’t fix it (and he couldn’t, no one would have cared what he said (another fruit of the council btw)) can it even be fixed? The “loss of the sense of the sacred” goes really deep in our late times. Poor St. Ignacio, poor uninformed parishioners. In our late times the later are also called as “good people” – so good that they doesn’t need to confess anymore. The good, tolerant God is awaiting them with heavens wide opened. Doesn’t He? Yes He does, He loves us. Maybe He is not even “he” – in our late times. The Christianity was always changing, today we have to not to live the Christianity of yesterday but the Christianity of tomorrow. And so on. St. Edith Stein was deeply moved in one museum when she was going to see Myrons Athena. Along the way she saw some 16th century Lamentation of Christ and she recognized that Lamentation points to reality and that Athena is just empty mask. Later she converted and combated uncreated world in the very centre of his annihilation method. Maybe for her it was easier or at least more straightforward than for young men and women of our late times who are going to see some Myrons Athena and along the way they meet some “work anchored in the cross”. I am presently reading a book – Charles Borromeo: Selected Orations, Homilies, and Writings – by Monsignor John Cihak lately from Rome now back in his home Archdiocese of Portland (Sample territory)! I would love to see CWR interview the good Monsignor about this book which should be given wider attention (I see that it was in George Weigel’s “Books for Christmas in CWR). St. Charles should be put forward as one of the standards for this liturgical reform among the people and his writings translated from Latin are spot-on for all priests and bishops looking for a true reform in this New Evangelization. So sad but quite true. Good article! God Bless! Dallas has a wonderful group doing TLM. Check it out!! Very special! I live in a very small village of 283 souls, thus very small parish. I have begged Father to have a HOLY Hour of adoration, to no avail. The sense of awe and silent time before mass is so precious, but it is squandered away by this and that group chattering away. Receiving in the hand, I perceive, leads people to treat the whole Eucharistic Liturgy way too casually. Just pop it in your mouth, cross yourself haphazardly, and go to your pew. I have always wanted to receive my Lord from consecrated hands on my tongue. The yearning and hunger for sacred postures and rubrics is real and intense as evidenced by increasing vocations who have “right” worship. The want to wear habits for that alone is a powerful witness without words. I am wearing a large mantilla as prescribed by St. Paul in Ephesians as as is comely for all females. In the current time of ‘diversity’ we need to know God made us with differnces and He saw it was good. Linda what you wish to do for an hour and cannot Christ is communing what you wish to your heart. That’s amazing. I just said, almost verbatim as the first paragraph, the same thing to a friend this morning and I open this article. The Liturgy and liturgical discipline are at an all time low. Fragments of the Eucharist are regularly lost because of the disregard for simple norms to protect it, long since disused. If we treated it like it was the source and summit of our life and reason for being, and the compendium of our Catholic Faith, then much would be different. Thank you Father Stravinskas. Thank You Father,I Am An Old Man And I Have Reached A Stage Where I Am Now Afraid To Live And Afraid To Die,I Am So Confused.The Church I Grew Up In And Served As An Altar Boy For Many Many Years Is No Longer The Church I Knew And Loved.I Am An Old Retired Soldier And House Bound Which Means I Can No Longer Attend Mass.If I Want To Receive The Blessed Sacrament I Have To Request A Visit From My Church And Then Some Lay Person Will Call On A First Friday And Offer Me Holy Communion,I Am Sorry To Say,I Cannot Accept That.I Spend Most Of My Day Praying And Saying Sorry To The Lord For The Stage I Have Arrived At.I Have Always Said That To Love Something You Have To Have A Little Fear Of It,I Watch Mass Daily On My Computer And In All The Years I Do This I Have Not Heard A Priest Speak Of Purgatory Or Hell,Where Did They Go,There Is So Much Gone And I Desperately Miss Them,Please Pray For Me,Amen!!! I will offer you up at tomorrow evening’s vigil Holy Mass at my parish. Dear Peter, Whatever may have changed, there is one thing that has not changed at all and that is Our Lord. He is with you and has never left you and He will never leave you. You are in my prayers that you may know His enveloping love. Just having people receive communion kneeling and on the tongue is not going to bring people back to church. Only a sustained and prolonged catechesis on what the mass is, what it does and what it means is going to bring a sense of the sacred back to people. I remember visiting a Russian Orthodox Church in a small town in central New York with my sixth grade class (yes, it was a public school). It was lit inside only with lamps, candles, and light shining through richly decorated stained glass windows, the light glimmering off of the gold, silver, and jeweled decorations and icons. Our entire class, even the class clowns, fell silent. One boy whispered, “Wow. It’s like we’re no longer on earth.” The priests were friars, wearing black cassocks, hats, and full beards. They were kind to us, showing us humbly around their beautiful church, and taking us out into their garden. Outside, we talked and giggled again. Passing back through the church, we were silent again. The sense of the sacred sang wordlessly to us in the art and architecture of that onion-domed church building. I still recall more recently the hue and cry of the progressives when the “dynamic equivalence” translation from Latin to English was corrected and made more accurate. How dare anyone tamper with their tampering! Our bishop brought in a man who gave a talk on the new translation shortly before it was implemented. He answered questions, explaining the nuances. After the new translation went into effect, our liturgy felt… better. Nobody had a problem adjusting to it. It turns out that the ordinary Catholic laymen could handle a deeper theological liturgical translation. They even liked it, and started following the missal more closely, including the postures. So, why not return to the older mode of reception? Or start with ad orientem, sending out people to explain it and prepare the laity to understand it? Or bring back a little Latin, or have chants and propers, dispensing with the four-hymn sandwich? Why be afraid to try any one of those, or even more than one? With Catholics leaving the churches, what could it hurt to restore some sense of the sacred? Lay Catholics are not fools, and are hungering for the sacred. Blotting it out or hiding it in banality isn’t giving them much help in finding and embracing it. I love both forms of the Mass, but something went strongly awry with the newer one. Trying to set it right isn’t “regression”. It’s a form of catechism to have beautiful art, architecture, music, preaching, and liturgy. In fact, for many centuries, when people were mostly illiterate, that was all they had, and it worked. We can certainly study about the Mass, and we can also have the Mass teach us. Both/and, not either/or. Whether or not it brings anyone back, it might well prevent more from leaving. Thank you so much for all the detail and truth of this article. I am a convert and over the past seven years I have found myself struggling at Mass. I feel like I am being crowded out by Protestantism. I see, more and more, the loss of the sacredness and I too feel it is the primary reason we are where we are today as a Church. As a child of fifteen walking into my first Holy Mass I knew I had walked into an extraordinary place and something other than “church” was happening. After my conversion into Catholicism I understood where I was and what was taking place and I was so incredibly grateful that God had drawn me there. Today, however, I wonder sometimes exactly where I am. We so desperately need to return to our first love, the true liturgy in all it’s rich meaning so that we can be drawn back to the truest form if worship. This can only happen if the people are taught about liturgy and Who gave it to us in the first place. We did not choose it God himself gave it to us beginning with the Exodus, Moses, and being in the dessert. So when we change it we are not just being disobedient to the Church but to God directly. Holy Mary, mother of God, pray for us! Thank you Fr. Stravinskas for a true testimony. I join with all of the voices who love the sacred beauty of Holy Mass, and I note that so many, like me, are expressing grief for the death of beauty and truth – the mystery of our Saving Lord and Our Father and the descent of The Holy Spirit in our Holy Church. The “reform” was an act of theft, stealing the endowment handed down to us from our forbears in the faith. The “contemporary clericalists” have trespassed, treating our Holy Mass like it is their property to dispose of as they wish, and substitute whatever they choose, based on what their personal disbeliefs and beliefs. No wonder fewer and fewer in each generation since Vatican II don’t go to Mass – they can see that it seems just like any other event – profane – not an encounter with The Holy One. There’s a lot of reason for hope regarding sacred worship. A lot of younger priests are open to recapturing sacrality and tradition. As a layman, I started a men’s Schola Cantorum to sing Gregorian chant at Mass. One of he local priests has started offering a Latin Mass which we sing at. There are a lot of resources now for Mass accessories and training in the Extraordinary Form than when we started our Schola 15 years ago. It really comes down to people in the pews doing their part and being ready to finance the effort when the opportunity presents itself. Father, thank you. Excellent article, especially appreciated your mention on or beloved Pius XII. Sadly, I do think your premise that the destruction of the sense of the Sacred is the primary (or even most important) cause of so many Catholics leaving The Faith. You referenced Orthodox & Eastern Catholic Churches. Their numbers have plumeted, just like ours. As one who loves The Divine Liturgy (as well as the Extraordinary Form) I can testify that their Liturgies are stunning. Full of Tradition & Reverence. Yet throughout Europe they are turning great Temples to Christ into museums. Just as we are. In the US it’s different only as imagrents increase numbers, allied with a healthy Protestant influx. Still these are tiny Churches and their kids are dropping their Faith just like ours. Even the TLM is small. Growing yes, but still small. And honestly, most TLM conversion is just from NO to TLM. I agree Father with everything you recommend. I with that if the American Church did all that tomorrow it would fill the pews. It won’t. Now, greater reverence might help raise up saints. And what will save The Faith in the West can only be a new Dominic or Francis. Both the article and the comments are thought provoking. But I think we need to focus on two things: Latin mass is available for those who want it, albeit perhaps limited to larger cities. But mass in one’s native tongue should be no less spiritually consoling and refreshing as mass in Latin, regardless of what vestments are used by the celebrant. And I believe hearing mass in the vernacular post Vatican II had a positive effect on the church. Society is changing, the church has been involved in some very public cover-ups, and with a growing world population and globalization, which the church supports, external influences are impacting on the number practicing the faith. These issues confronted St Pope John Paul II who also struggled as to how to address such significant societal change. On Ministers of the Eucharist, in my church, which still has a large attendance at the 4 weekday mass’s although the demographic of the congregation is mainly over 50s’, such ministers do assist the celebrant/s, more so at the Saturday vigil mass when the congregation may receive communion under both kinds. The liturgy is central to mass and our faith and we need to cherish it when we are now privileged to hear the mass celebrated in the vernacular; the language mass is celebrated in is not the barrier to hearing mass in a spiritual way, but what we have in our hearts when we attend mass. I recall folk chattering at mass when it was in Latin just as some chatter away at mass now, which I find disrespectful to one’s fellow worshippers. William, thank you. You seem to have touched on what Father was so beautifully conveying. Sadly, some of the comments seemed to veer off topic. The Extraordinary Form is heart-rendingly beautiful but that genie is not going back into the bottle. Most American Catholics will worship in English for the foreseeable future. Let’s do what we can to bring the authenticity of the Extraordinary Form into the Ordinary Form. Father’s point was that the Ordinary Form can be reverent & theologically correct. Not that we should all take our ball & go home to the TLM. My only critique is that we should make the Mass beautiful for the Glory of God. If we do it for any other reason it won’t convert anyone. Mass is beautiful in Greek, Aramaic, Latin, or English. If and only if the Mass is said with reverence. Now, I’m lucky here in Phoenix. 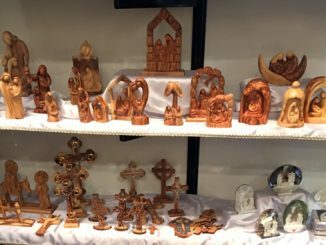 Many options for the Extraordinary Form, reverent Ordinary Form at a number of parishes, many Eastern Rites that our beloved Bishop is supportive of. (& a few 70s holdover parish). Life is good!